It’s been two and a half weeks since I started eating intuitively and while I have gotten a LOT better at recognizing my cravings, listening to my hunger/satiety cues, and recognizing emotional eating, it’s all been through trial and error. I know lots of people who have hopped on board the “conscious eating” bandwagon, but I don’t think it does much to curb your cravings in the long run. As a practice I love the way it feels when I get to do it, and it helps strengthen social bonds with the people I do it with, and for that reason it’s wonderful. But in my experience it’s easy to jump into, hard to maintain. Its usefulness mostly relies on your ability to surround yourself with people who have the same food values. For me this has always been fleeting. It feels great when you start doing it, but work schedules, dentist appointments, and the needs of others don’t stay silent for very long. If you’re okay having a community that exists online then you might be alright, but my food decisions are usually made in the moment. To understand why you eat so much it’s useful to think about what makes you hungry in the first place. The key point is this: physiology drives behavior, not the other way around. To put it simply, your body wants to do everything it can to satisfy itself today and do what it can to make sure it has enough calories if food runs out tomorrow. Today the food never actually does run out, but the instinct still keeps ticking. Processed food ignites cravings because it gives your body a calorie bomb that’s associated with a well defined taste association, which activates pleasure sensations in your brain that make you crave more. The combination of quick digestion, extreme sweet and saltiness, and energy density ignites a hormonal cascade that causes your body to want to stock up on food for future use. There are very few biological checks and balances on this process, which is one reason obesity has become so common place. Mindful eating does a lot to solve this, since the calories you’re eating are higher quality and coming towards you at a slower pace, but it’ll often be an act of willpower which is bound to run out, especially as your social environment changes. (Mind you I’m not saying anything negative about the act of conscious eating itself, just expressing skepticism about its sustainability if you want to use it to fight cravings. Anyone who wants to try it has my blessings for all sorts of reasons). A good rule of thumb is to make your diet as nutrient dense as possible, regardless of calories, food groups, or speed of eating. Doing this ensures you’ll have the nutrients your body needs, and eliminates the concentrated taste sensations that ignite your body’s desire to store food. The hunger/weight suppressing effect of doing this, even for a little bit each day (like juicing or smoothies), helps reset your physiological clock from going overboard. It also eliminates a lot of the details that cause food overload and ego depletion. My improvements with hunger and cravings have come from a heightened awareness of “triggers” that set me off, and learning how to avoid them. There are certain foods that will make me hungrier no matter how much of them I eat, so I avoid them. Sleep is also really important. And for some reason a glass of green juice in the morning goes a long way towards suppressing food anxiety. When I get these details right I automatically become more mindful because my body doesn’t have the innate urge to stockpile, and mindful eating comes naturally. PS – Heather if you’re reading this I’m NOT trying to discourage you from your journey! Just sharing my own experiences on the matter. Good luck! Previous Post Incredible Berries Is Here! Save 50%. It’s funny that you write about this, because my inability to slow down my eating due to my schedule is why I like Incredible Greens. If I don’t have a good lunch I ALWAYS start snacking during the afternoon but if I drink ig then I don’t get the cravings. I’m on th road a lot for work and so its hard to stay away from fast food and cheap buffets. That’s why a lot of people use IG. More often than not people like to use it for smoothies in the morning and as a snack replacement during the day to keep their energy levels up. Potato chips are my weakness. If I have one I might as well just have the whole bag. I’ve tried going without them the last two weeks and it was going well but I’ve had some cravings recently that I couldn’t fight. Same here. For me all processed carbs make me hungry with a capital H.
Our family have been more mindful (no pun intended) about eating together in the evenings and so far we’ve really enjoyed it. My husband gets things started because he gets off work before I do and I make sure I stop at the grocery store if he needs anything. It’s a bit of work and very hard with two working adults but it helps us have quality time with our kids which is really important for us. Like you said i’m not sure we’ll be able to do it forever but i’m really glad we can do it now. 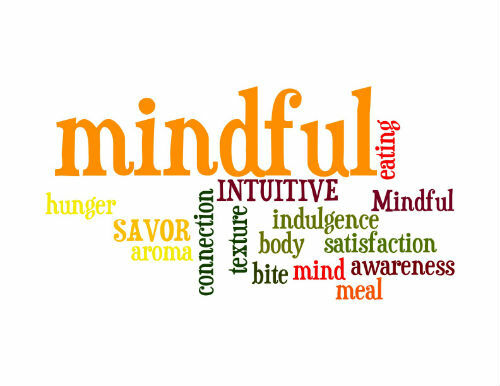 There is emerging research that mindful eating can decrease food cravings in people with eating problems. That means eating meals at the table, eating slowly, enjoying food and leaving judgment out of your thoughts about food. That means no more “I was bad so I might as well throw caution to the wind” or “I shouldn’t eat that because it is bad for me.” It’s all about listening to your body and trusting yourself around food.